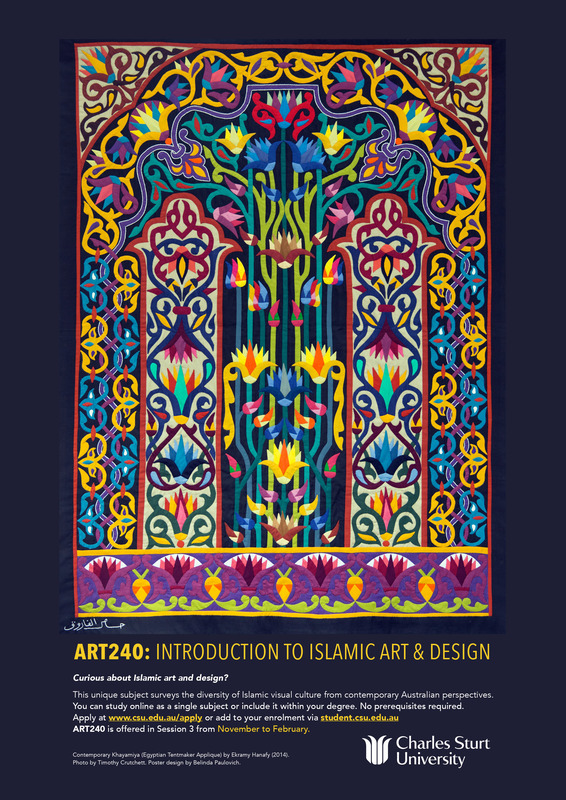 ART240: Introduction to Islamic Art & Design is Australia’s only online undergraduate subject dedicated to the diverse visual cultures of the Middle East, North Africa, Central and South-East Asia, drawn entirely from contemporary perspectives. This unique subject is available as an elective to any degree program in Charles Sturt University. You can tailor it to your interests through focus areas that include textiles, architecture, gender, and design implications. No prerequisites required. Even if you are studying at another university, you can enroll in ART240 via CSU to add a valuable point of difference to your CV and demonstrate global cultural awareness. It is taught over 10 weeks between November 2015 and February 2016. Assessment consists of collaborative and continual Forum Participation, one Online Presentation for your peers, and one Essay. Apply at from outside CSU here or add ART240 to your existing enrollments at CSU. ART240 is also a Teacher Identified Activity for professional development according to the ACT Teacher Quality Institute (TQI). Click on the ART240 poster below for a detailed version. You are welcome to print and display this image.